I had some extra red velvet batter and cream cheese frosting left over from graduation cupcakes I had been commissioned to make, so rather than let it go to waste, I made a one layer 9″ cake. Since the graduate was heading to Frostburg State University and would be playing baseball for the Bobcats, I added a red and black paw to the candy melts I was already making for the other cupcakes and cake. I also used candy melt molds to spell out FUTURE BOBCAT. Around the base, I piped on bursts. In a feat that would make Sister Francis Miriam — my elementary school algebra teacher — proud, I counted the bursts and then based on the number of mini-M&Ms I had, figured out how to space them equally around the base in the center of those bursts. I then added ruby red pearlized sugar sprinkles on top of the bursts. Here’s a shot that shows the base with the mini-M&Ms and sprinkles. Always remember to place the “M” side down. All the best as you head off to college this Fall, Josh! This season, one of the seniors on the varsity Walkersville Lions high school baseball team set the record for most career steals. Josh has played on the varsity team all four years of high school. Since I love to make these pay-it-forward types of goodies for people we know in the community, I was ready to fire up the oven and get baking! 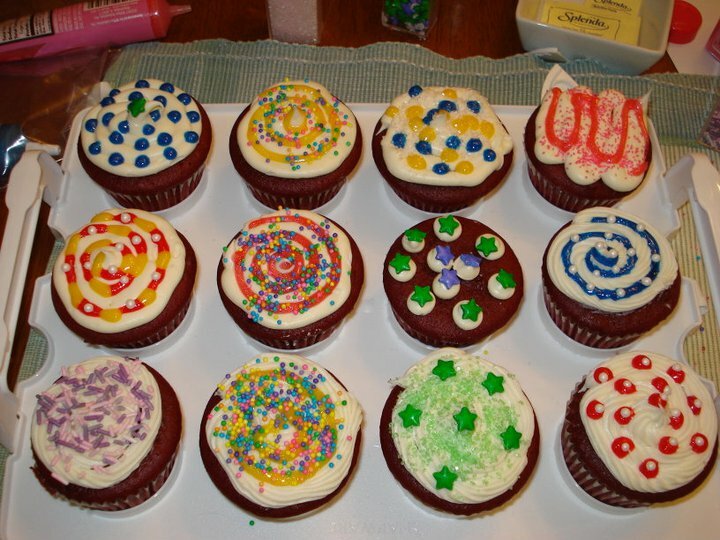 This would be my gift to him, as I was already commissioned to make the cupcakes for his graduation party. I decided to go with an baseball infield cake, so I started with the 12″ square pan in red velvet – Josh’s favorite cake flavor. I wasn’t sure how I was going to decorate it, but would worry about that later. After some thought, I decided to make a baseball infield with the bases. I made one cake in the easy layer square pan, and cut the layer into quarters for the square bases. One of the squares I fashioned into the shape of home plate. The entire cake was covered in canned white frosting. The bases were placed on top in each corner of the diamond, and I frosted them as well. I made a large lion paw in royal blue and yellow candy melts. For each number of stolen bases in each year, I made royal blue numbers. I dyed some of the icing golden yellow, and piped the year (“Frosh”, “Soph”, “Jr”, “Sr”) on the base to indicate the number of bases stolen each year. The total number was in the middle, along with the paw and “Career Stolen Bases” piped on in the golden yellow icing. Around each base, I added brownie/turtle crunch topping. It’s my “go-to” for dirt for all the baseball cakes I make. Unfortunately, I can’t find it anymore (may be discontinued?) and since I didn’t have a lot left, I only placed it around the bases and home plate. Originally, I wanted to make the entire dirt infield, but we pivot when we must! Around the entire base, I piped on a burst and placed a large white sugar pearl in the center of each burst. Finally, I added royal blue and yellow sugar sprinkles on top of the bottom border. Congrats Josh and all the best as you continue your baseball career in Frostburg! Months ago, I had been commissioned to make to make cupcakes for a graduating high school senior whose younger brother plays baseball with my son Alex. The one potential wrinkle…I had surgery on May 31 to repair/rebuild a ruptured Achilles and remove a bone spur on my heal. I would be off of my foot completely for 6 weeks, and then move to a boot/walker for 2 weeks. By the time of the party, I would be in the boot/walker phase of recovery and able to take on this task. Well, not so easy to begin walking on a foot in a boot when you’ve been off of it completely for 6 weeks. But I did manage not only the 36 cupcakes, a career stolen bases record cake, but also a cake celebrating the college he would be heading to. Then, it was on to the cupcakes. The cupcakes were red velvet, at the request of the graduate. Given that I was just starting to walk, I used box mix for the cake instead of making it from scratch. As always, I add a tablespoon of vanilla when mixing to make it taste more homemade. Because I had been asked to make 36 cupcakes, I had half of one box of batter leftover. 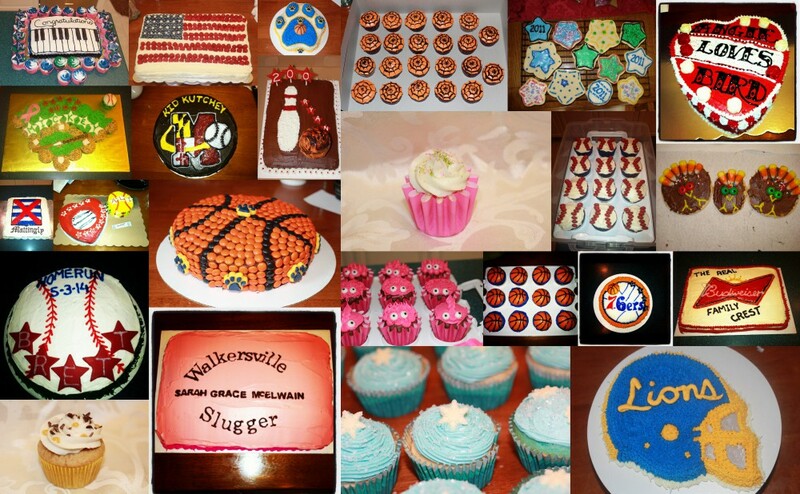 I used that for one layer of a 9″ round cake to make his college-bound cake. I started with blue and gold foil cupcake liners I found on Etsy (very pleased with this vendor’s service and the product I received), which are the colors for the Walkersville Lions. I topped the baked cupcakes with a swirl of cream cheese frosting — another confession — I used canned frosting (easier than making from scratch in my post-surgery state!). I then used blue and yellow sugar sprinkles on top. But that wasn’t all! I made candy melt paws in royal blue and yellow to top some of the cupcakes. For others, I made square royal blue candy melts, and topped them with cream cheese icing dyed golden yellow, piped on with a #2 tip to from the tassels with a yellow mini-M&M in the center. I placed them on top of an inverted mini-Reese’s peanut butter cup. Baker’s note: I bought a small tube of mini-M&Ms at the grocery check out line and had only 18 yellows, since the pack contains multiple candy shell colors. Also, if you are aware of any peanut allergies, you may have to forego the mini-Reese’s and just put the cap on top of the frosting. Congrats Josh – and all the best as you head to Frostburg this Fall! In the local sports association football program my boys have played in, they have weight limits for age groups. If you are over the designated top weight for your age group prior to the first game, you must either sit out games (and be re-weighed a few weeks later), or play up in the next age division. Our oldest son was always close to the top of the weight each year. And his second-to-the-last year of playing, he was over and had to work real hard to make weight to play with his friends, rather than sit out or play up with older kids. Helping growing boys make weight – it’s awful. I even blogged about the experience. When one of the young kids was faced with a similar battle this year, his mom asked for ways to help Jonny drop the weight in advance of the official weigh in. Many people chimed in with advice; parents and his teammates offered to run extra laps and work out with him more. I know it seems counter-intuitive to offer someone baked goods for losing weight. But so what – motivation comes in many forms! After a lot of hard work, sacrifice, and self-discipline, Jonny made weight. His mom let me know he liked red velvet cake with cream cheese frosting. I used a box cake for red velvet – I haven’t found a scratch recipe I like yet. For the icing, I used a classic cream cheese frosting recipe. The recipe made plenty of frosting and I used the leftovers to frost some banana bread later. My mom’s 70th birthday is October 15. We had a big family and friends celebration on October 7. Over 100 people joined the festivities, including relatives from Canada and California. Even though the party was catered, my oldest son Alex and I made mom a cake. It was red velvet in a heart-shaped Wilton pan. I iced it using cream cheese frosting. 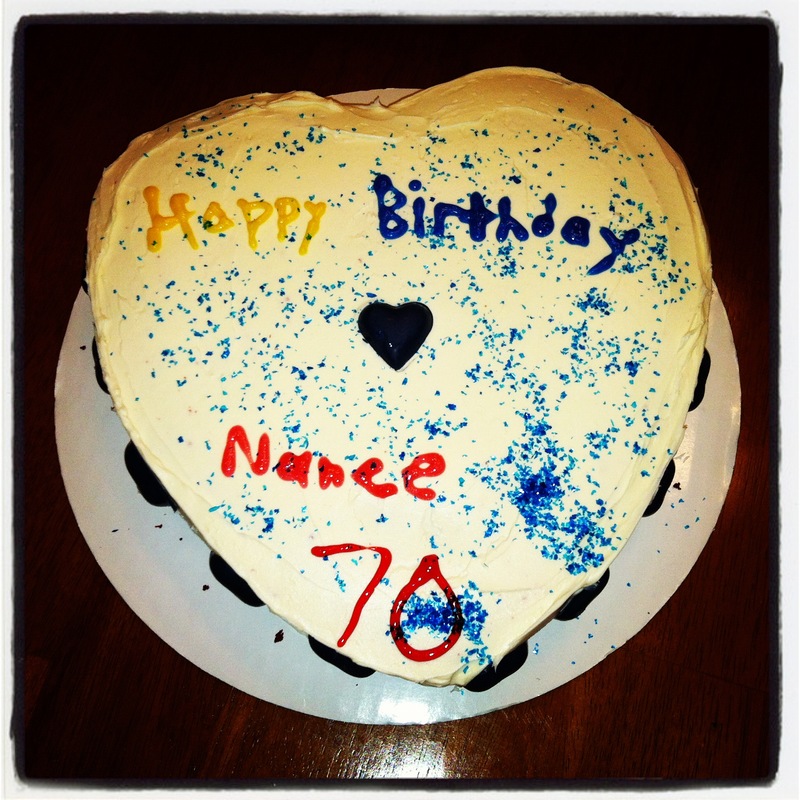 My son Alex decorated it with different colors of Wilton sparkling gel frosting, spelling out Happy Birthday Nanee (what all the grandkids call her) and a 70. He added blue candy melt hearts around the side of the cake, as well as one on top of the cake. Then Alex sprinkled edible blue shimmer dust on top to finish it off. I know it wasn’t the fanciest cake that day, but to me it was a masterpiece. These cupcakes were created for a friend’s 40th birthday. She’s a great gal who has had a bit of a rough road the past few years. 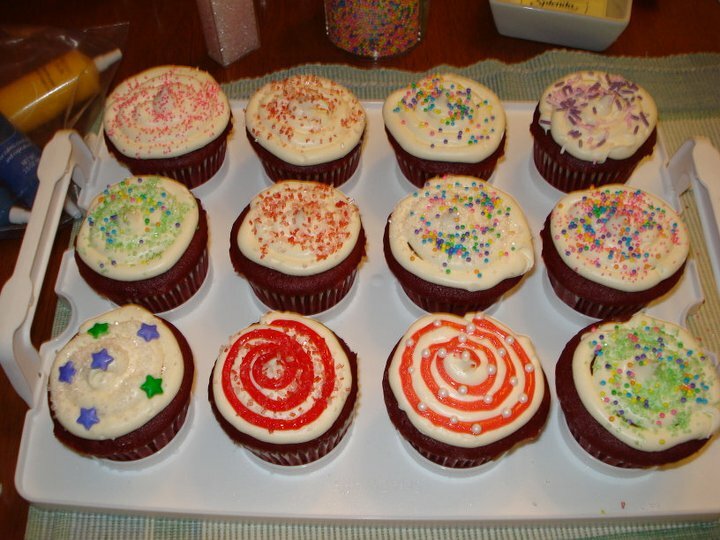 They are red velvet cupcakes with cream cheese frosting applied with tips. I embellished the cupcakes with a variety of sprinkle types and/or sparkle gel frostings.